This past weekend was my third trip to the cabin this month, and I’ve made some good progress on the interior during that time. I’ve finished the bedroom, textured and painted most of the walls, installed about 3/4 of the laminate flooring, assembled some more Ikea furniture, and got a small start on the kitchen. I have started to feel a bit like a prisoner in the cabin this month though since I’ve rarely been able to get out and enjoy my land, and it’s not just because of the work I’ve been doing. The mosquitoes are about the worst I can remember. There’s been way too much rain lately, and I have areas of standing water in the field and in the woods. This and the higher than normal heat have made for a perfect storm for mosquitoes. My plan for August is to finish the walls, floor, baseboard, and kitchen, and to get the rest of the furniture in place. I hope to start some pressing outside projects, like the front wall siding, come September and October. I prefer saving the outside work for the cooler months when it’s not so oppressive in the sun and there’s fewer mosquitoes. 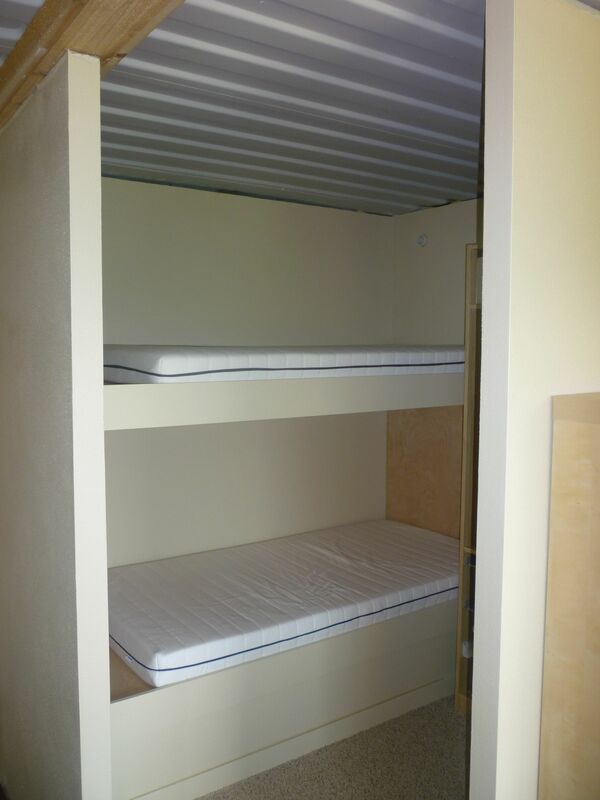 The last picture I have to share is of the “micro bedroom”. 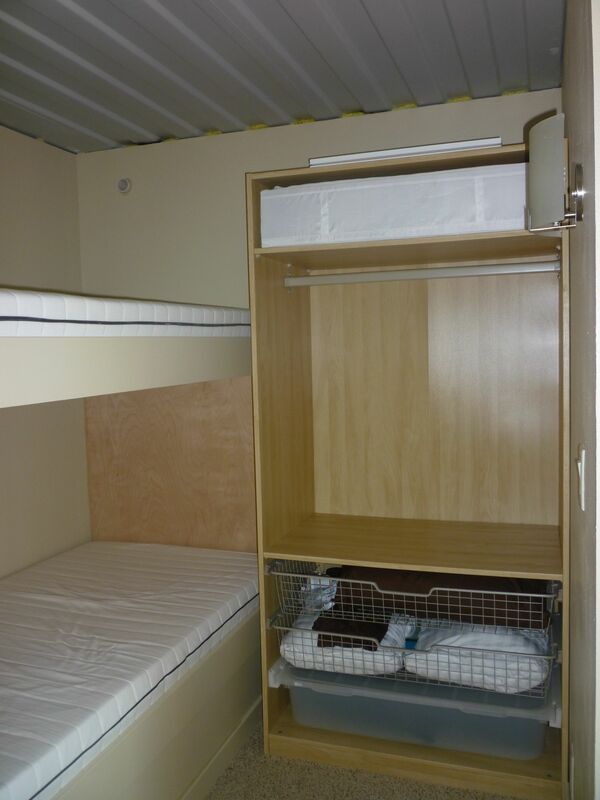 While there are two beds (bunked) and a wardrobe, there’s only about 18 square feet of open floor space – about enough room for one person to get dressed at a time. I personally don’t feel it’s too small and, in fact, the lower bunk is my youngest son’s favorite place to curl up and read a book. This entry was posted in Construction, Furnishings on August 1, 2011 by Steve. Hi. Love your site. 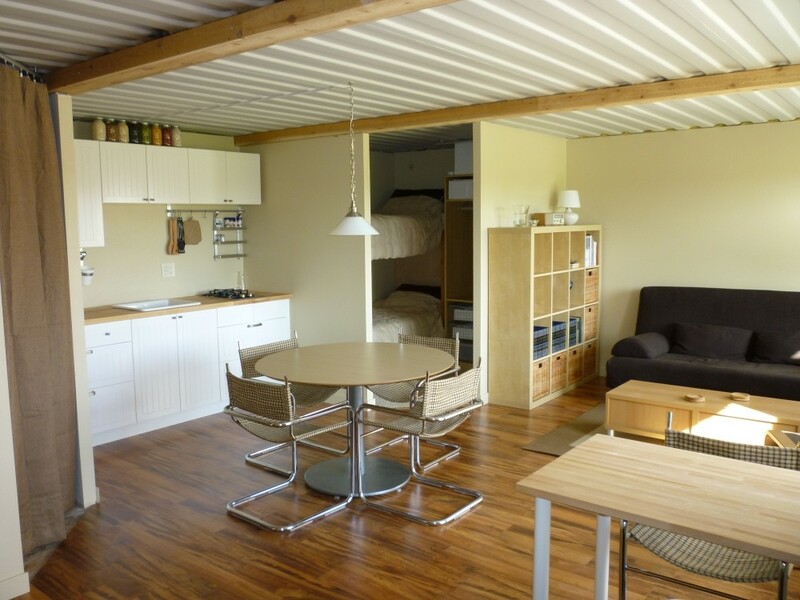 I just learned about building homes out of shipping containers and now I’d like to buy a piece of land and do what you have done. I’m curious – I have not seen anywhere what size containers you used. I know they are all 8 ft. wide but which length did you choose? It looks like the smaller size of 20 ft. Is that correct? Yes, they are standard 20 foot containers. Have you considered building a bat box? They LOVE mosquitoes and you can put it away from the cabin so you don’t really have to deal with them. Bat boxes can be nailed to trees but much like a bird feeder or bird house it is probably best to stake them with a confusion bell to keep squirrels out of it. Bats are shy, after all. They eat insects at about 1000 per hour. Pretty awesome pest control if you ask me! I’ve thought about them before, but it’s one of those things you never get around to doing. When I bought the property 20+ years ago, there was a small decrepit farmhouse with asphalt siding on it. When we took the siding off, there were bats everywhere underneath the siding. I’m sure it wouldn’t take too much to bring them back – maybe next year. Do you have any new pics of the interior of your cabin? I’d love to see more. Do you have a kitchen yet? I’m not quite finished with the interior, but I will give you a little preview of where it’s at right now. You can click on the pic below for a larger image. Looks great. 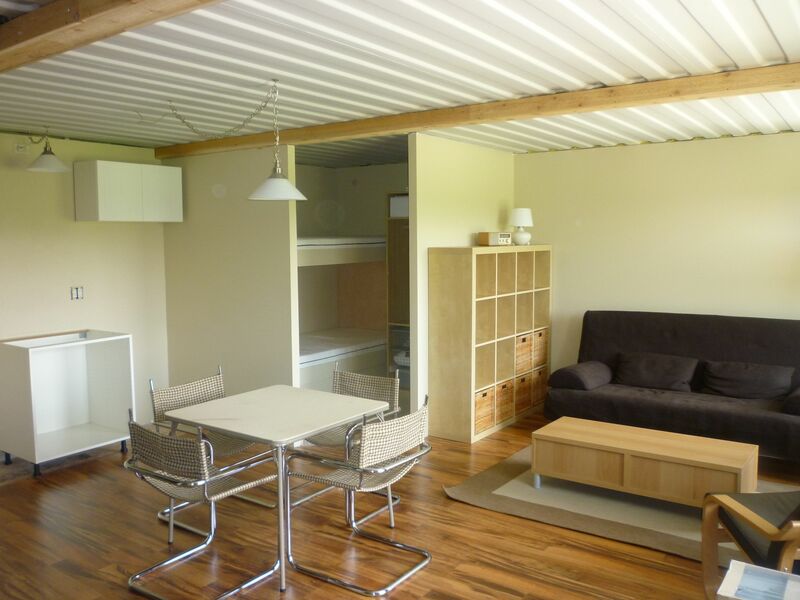 You have the best site on the web in regards to someone showing the their progress of building a shipping container home. I keep coming back to your site to look at the pics. I found one other site where I was able to download a PDF with a ton of great pics and I look at that as well. I hope someday to be able to build a 2nd home on some acreage with 6 – 40′ containers (3 on top of 3). I’ve already found most of the materials that I would use both inside and out. Now if I could just find a large piece of land that I like and could afford not far from Dallas – I would be set. Hi Jeff, I agree this is an awesome site – well done Steve! I’ve been gaining inspiration for something like this too. What is the other site you have been looking at in regards the 6x 40′ containers? 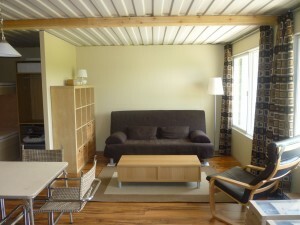 It’s now 2013, and I’m wondering what your tin can cabin looks like today? Did you work out all the “kinks”? It’s beautiful and so Eco- friendly! It really doesn’t look that different than what you can see in the gallery and posts. I was waiting till I was done with everything before I took another set of interior and exterior shots. The problem is that there always seems to be something else to add or improve when I’m there. I’ll try to get another set of photos before the snow flies this year.